Do you have a group of employees at your company who require training on a particular topic? Do you need advise in PCB's failure analysis? Would you like a training concept that is customized specifically to the requirements of your manufacturing process and is based on the level of expertise of your employees? Then you have come to the right place. Our coaches will be delighted to design a program with you that is customised specifically to your needs. You decide where: at our training facilities, at your company or online, in the virtual meeting room. 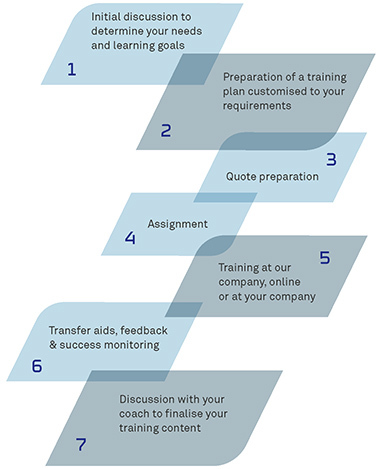 Customised program: We coordinate the training contents and methods for example in the area of failure analysis specifically in line with the requirements of your company, manufacturing process and your employees. Cost efficiency: Gather a group of employees at your company and train them at the same time – without any travel costs. Tailored to your processes: Training courses based on your processes makes it easier to practically apply the knowledge in your own company. Familiar atmosphere: Even sensitive subjects can be discussed in a closed group, which encourages the exchange of experiences within your company. It goes without saying that we will handle these subjects with the utmost discretion. Absolute flexibility: You decide the time, duration, location and contents. We provide training for the entire range of topics relating to cleanliness and the reliability of electronics manufacturing. From professionals – for professionals: Our coaches are all process engineers at ZESTRON and experts in their field who will work together with you to prepare your individual training concept. We would be happy to prepare an individual quote customised to your needs.